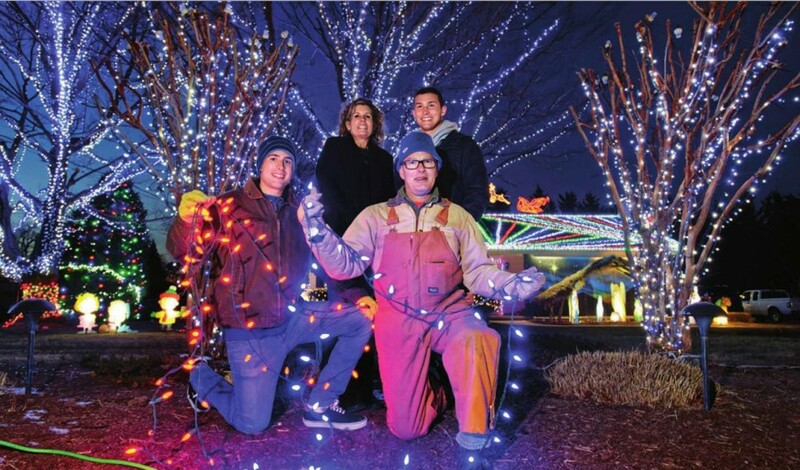 Lisa Prestipino hears from people all the time about how much they love the extensive holiday display that adorns her family’s business on Route 24 near Midway every year. Area families pose for their Christmas card photos there. Couples have gotten engaged on the property. Parents call and ask if the lights, which normally go off shortly after New Year’s Day, can remain on just one more week because their grandkids are visiting or a son or daughter is coming home on military leave. “It’s very rewarding,” Lisa says. She also hears from moms who avoid the location. They don’t have the extra 20 minutes to spend every time they drive by and their youngsters want to stop and admire the display. The co-owner of Apple Electric isn’t offended. As amom of four sons (ages 15 to 23), she gets it. In fact, Lisa has avoided her own business after hours when her husband, Stephen, is in the car. “He’s the biggest kid of all,” she says. Since the couple began decorating their electrical business to draw attention more than a dozen years ago, the display has evolved. Lights blink to the beat of a rotating mix of holiday tunes, chosen by Stephen. (They can be heard on FM station 88.1 when in the vicinity of the business.) Holiday characters, many from the classic tale “Rudolph the Red-Nosed Reindeer,” fill the yard out front. There’s the Island of Misfit Toys, the Abominable Snow Monster and Hermey, the elf who wants to be a dentist. Gingerbread men, Raggedy Ann, Charlie Brown and the Peanuts crew and, of course, Santa in his sleigh also greet visitors. “Right from day one, we’ve always had a manger,” says Stephen, who is working on a different pattern for the lights on the roof this year. With so many people stopping to see the show, the Prestipinos decided it should benefit a good cause. In the early years, the display raised money for the Lewes Fire Department. (Contributors would pay $1 to guess the number of lights in a 50-50 contest. The winner got half of the total and the fire department got the rest.) About 11 years ago, the focus shifted to Toys for Tots, a longtime initiative of the Marine Corps League, a congressionally chartered veterans organization. “We just took it seriously,” Stephen says of the goal to gather at least 1,000 toys the first year. They’ve hit that mark annually. Phil Folan of Rehoboth Beach, a retired U.S. Marine and former commandant for Marine Corps League Detachment 704, saw firsthand the impact the business’s toy drive had on coastal Sussex families in need. “I had days when I took two trips a day [to collect toys from Apple Electric]. That’s how many toys we had,” he says. He sees it in Apple Electric’s toy drive, in other businesses and organizations that sponsor collection sites and by the individual contributors to Toys for Tots throughout the county. “The people in this area are more than generous,” he says. ? Can be dropped off at Apple Electric at 18854 John J. Williams Highway (Route 24, across from the Beebe Health Campus) until Dec. 21. Retired Marines collect the toys and distribute them through various churches and organizations that identify children in need in coastal Sussex. All donations are gladly accepted, but the organizers recommend gifts that kids can play with by themselves, especially outside, such as basketballs, fishing poles and bicycles. Copyright © 2008 - Apple Electric, All Rights Reserved.